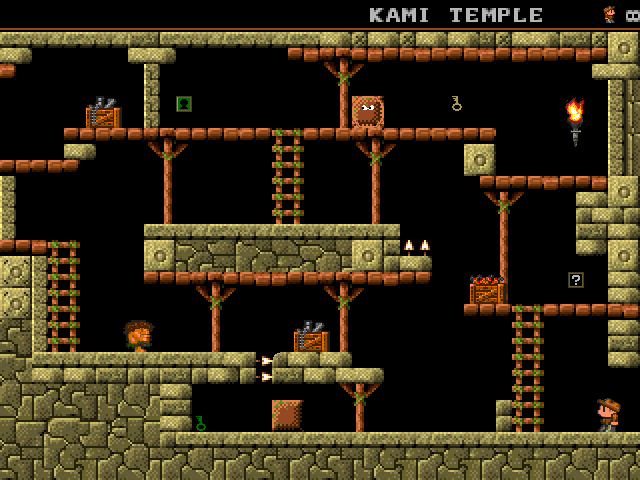 A challenging puzzle platform game with tricky and ingenious level design! Jump, shoot, throw dynamite, blast walls and avoid spikes and loads of traps. 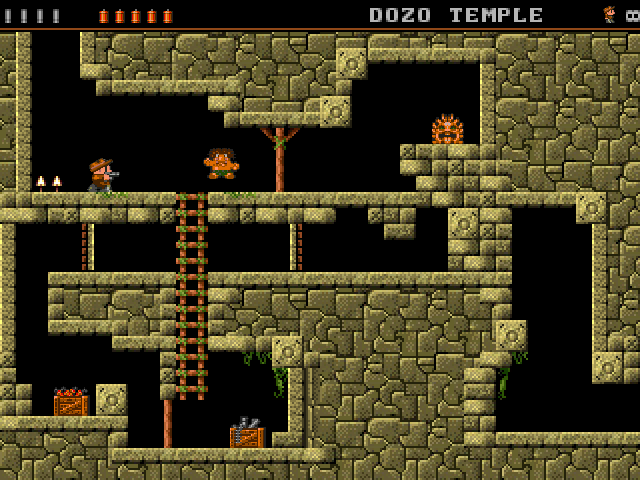 This game is a mix of Rick Dangerous (Amiga) and Kings Valley II (MSX). 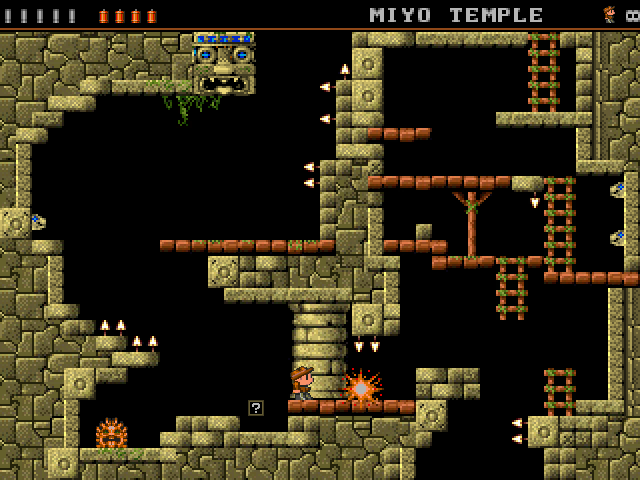 Explore temples with living stones, moving platforms, ingenious deadly traps and some tricky enemies. Collect keys, open doors, watch out for watertraps, use buttons to control moving walls and platforms! Move and stack blocks to reach higher places, use moving doors, find hidden spots, use hidden items and much more! 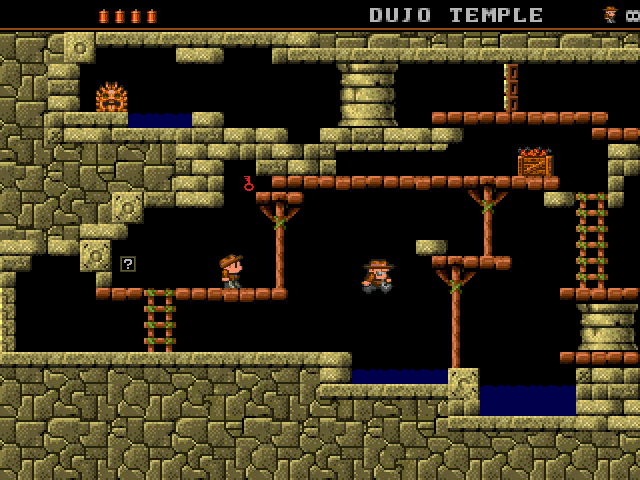 This is Indiana Jones retro style!! You can even play with Rick Dangerous! 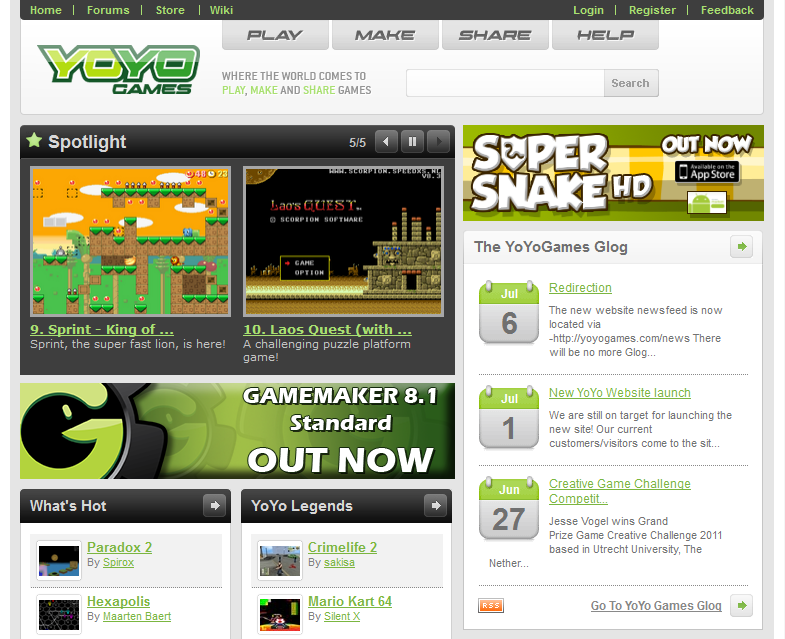 * This game in the SPOTLIGHT top 10 of [YoYoGames link] out of more than 130.000 games! * Extremely tight gameplay You have excellent control over your character, using either keyboard or gamepad. Pixel perfectly executed. 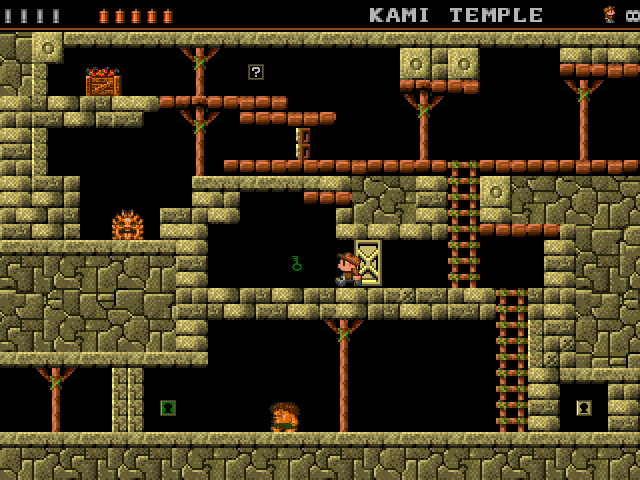 * Brilliant level design This is a puzzle platform game. Therefor, I put a lot of time into the level design: It's ingenious, complex and hard. And I mean hard in the way you really have to think how you're gonna solve a level. It'll be immensely rewarding when you solve a level. It's brilliant! * Duo play with Rick Dangerous As a tribute, the last temple features duo play with Rick Dangerous. Rick can be controlled, and together you must solve the level, with increased complexity, using each characters strong points - Lost Vikings style! * Checkpoints and ingame saves Use ingame Timestones to save your progress for easy continuation of your game or use passwords to start at any level! Some video's I recorded myself (denoted by a #), and other videos by fulthrotle1966 (denoted by a *). Thank to fulthrotle1966 for recording it!.. nice job!. If there's no link, then it means that the video is not uploaded yet. 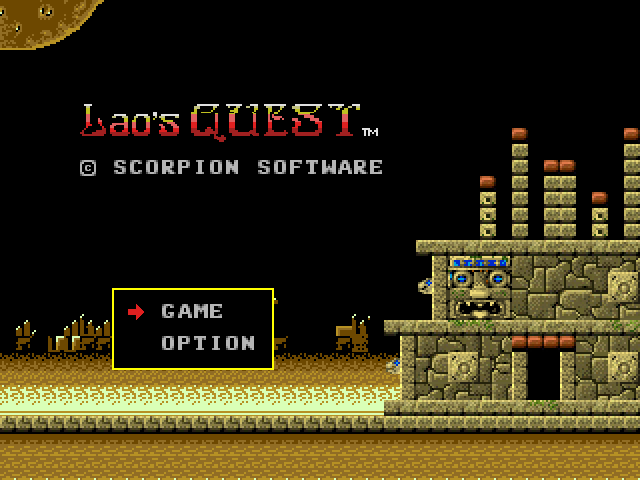 I used to play Rick Dangerous (Amiga) and Kings Valley II (MSX) a lot in the old days. I really liked the sneaky traps and cunning level design of Rick Dangerous. 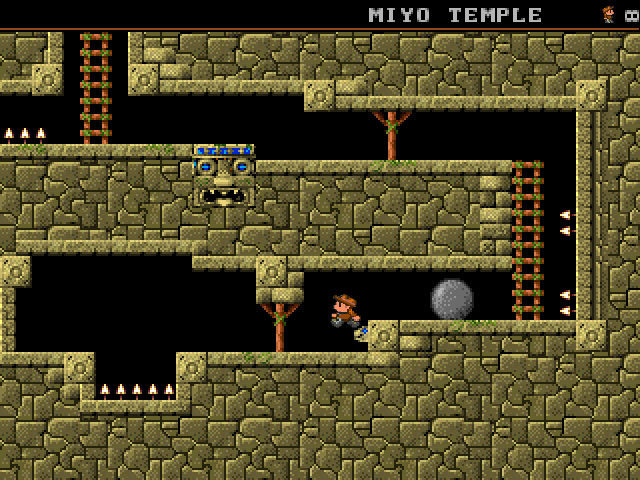 The use of guns and dynamite to blast your way through, spikes and shooting darts and of course the big rolling boulder. Switches to enable something and those irritating enemies. But I had the idea some things were missing. Kings Valley II (MSX) is awesome too! 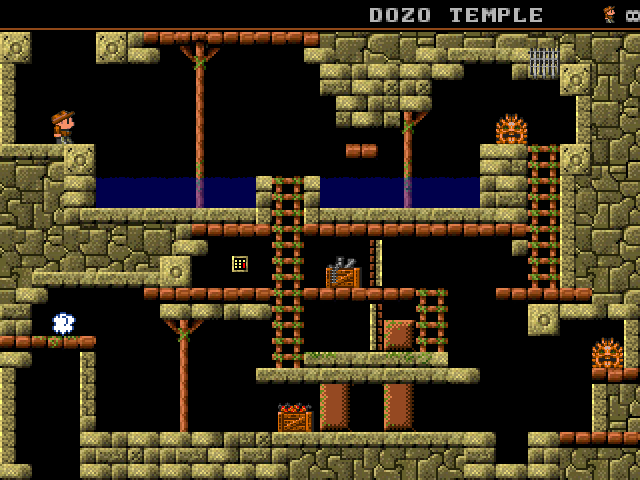 It had potential to build really difficult levels with the sorts of traps the game had, like blocks, disappearing bridges, rolling living stones, etc. I decided to merge those two games into one new game. Picking all the traps I liked from both games. I added some more traps, like moving platforms, falling ceilings, panels to operate different pilars, traps with water, keys and doors and a lot more, all mixed in a ingenious way. It will make you have to think hard! I had a look at the screenshots for Rick Dangerous Advance for the GBA, and got my idea for the graphics. While at first I ripped the graphics (I didnt have much time to spend on graphics or music), during the months I was working on this, I slowly replaced them with my own graphics, although they still might look familiar, since the color palette is still the same. Next, I loaded up one of my favorite games "King's Valley II" for the MSX and got my other ideas for the graphics from there. If you look closely you can find some concepts of that game, like some traps, the intro screen and the map screen. The sounds effects are partly from Rick Dangerous (amiga), Kings Valley II and some other sources from the internet. Some of the sounds I edited with Goldwave. I programmed the whole game from scratch and I tweaked it many times so it would satisfy my gameplay standards. I also added duo play with Rick Dangerous! 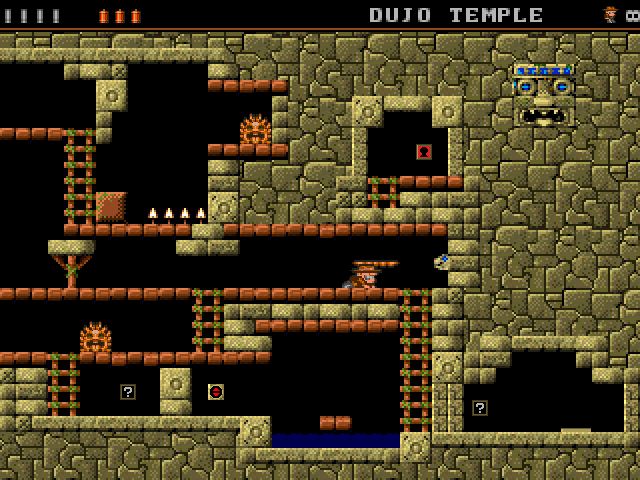 When you get to temple 6 (DUJO TEMPLE), you get to play with Rick Dangerous "Lost Viking" style! You control both Lao and Rick and you have to work together to solve the puzzles. Rick can crawl and duck, jump higher and further, but hates water and cannot hold as much ammo as Lao. 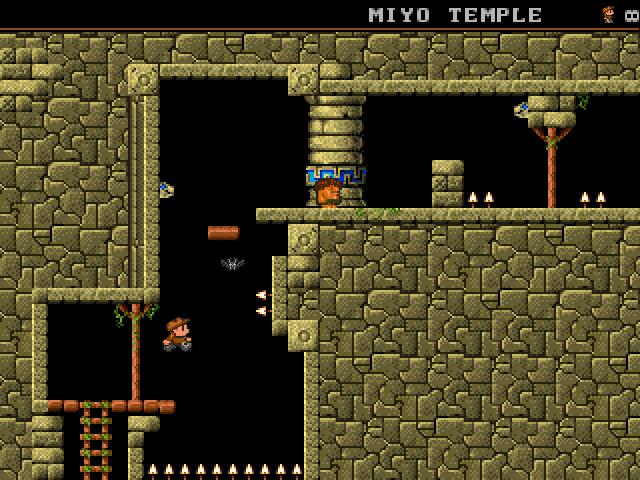 Use each of their advantages to solve the room and work your way deeper into the temple! Use password "SAAABQZWIZ" and jump directly to room601 and get control of Rick! and remember, gameplay is what it's all about!